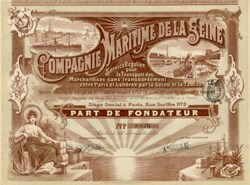 Beautifully engraved certificate from the Compagnie Maritime de la Seine issued in 1899. This historic document has an ornate border around it with vignettes of an allegorical woman, and pictures of ships, bridges, the Eiffel Tower, lighthouse, and buildings along the Seine River. This item is hand signed by the company's officers and is over 109 years old. The company shipped goods to and from Paris and London.